Here's your chance to experience wildlife and the meandering Sol Duc River! You can't get much closer to the river than this, close enough for fishing, watching elk drink, or deer playing. Your little piece of paradise amidst cedars and birch trees and the soothing sounds of the Sol Duc River. 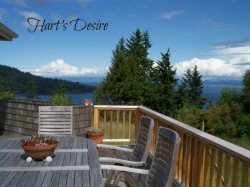 Just an hour and 15 minutes from Sequim, 25 minutes from Forks and less than an hour from the ocean. This quaint cabin is perfect for that special romantic getaway or that much needed fishing trip! Cuddle up with a blanket and a hot cup of coffee next to the warm fire and enjoy the serene and ever changing view out the large picture window that invites the outdoors right in. The fully equipped kitchen has everything you need for whipping up meals at home including two separate ovens. There's even a BBQ on the back deck overlooking the Sol Duc River with outdoor seating for grilling and enjoying a glass of wine. With all the comforts of home but far enough away from the hustle and bustle of the big city, if you want to getaway from it all, this is it. ***There is an age restriction on children under the age of 12 years old due to proximity to river. ***Wireless Internet and Cable TV are limited amenities and only offered May through October. The team was friendly and professional. They were very accommodating with us checking into the property onsite as well as checking out of the property. We called after the required time because we didn't have cell service and they were very understanding. I'd happily stay at riverside retreat again; we sincerely enjoyed the fire pit and awesome nights sleep! We enjoyed every meal outside during our stay and the relaxing sound of the river. We spent 6 nights here. The cabin was clean, comfortable and well appointed with a great location on the Sol Duc river. Easy drive to many great hiking areas, Crescent Lake, and Port Angeles. If you are wanting to explore OP or just get away, this is a great spot to do it. Easy reservation and fantastic service. Wow, such a beautiful place...We came to celebrate our birthday at the Riverside Retreat. It really is a retreat, its also a home away from home. We loved the house, the sound of the river as we sat on the deck, and looked forward to breakfast in the sitting area looking out at the river. It's such a serene place and there are so many nearby places to visit. We got to see a bald eagle fly by the house up river, so graceful for such a large bird. We visited Cape Flattery, Second Beach, First Beach, Rialto Beach and the Hoh Rainforest. This will be a trip that we both will remember, such precious memories that will last a lifetime! What a gem you have here and you thought of everything to make others feel comfortable. Very Cozy! We wish we had been able to spend more than two days here. The deck, the barbeque, and all things you left for us made it unforgettable. Thank you for sharing your home, we will be back! The Sol Duc River is soothing and easy to watch for hours from the house. We love all the little homey touches throughout and are grateful that you allow guests to share this lovely retreat. Your cabin is by far our favorite and we would love to return one day! ***Please note that the nightly rates on this property are based on 2 guests with an Additional Nighly Guest Fee per person up to 4 guests max. ****Age Restriction on children under the age of 12 years old due to proximity of river.